Tuesday's Republican primary for the US Senate put Corey Stewart in an awkward place: He won with less than 50% of the vote (on very puny Republican turnout), and every big buck Republican and conservative machine immediately announced they wouldn't be participating at the US Senate level in Virginia this year. 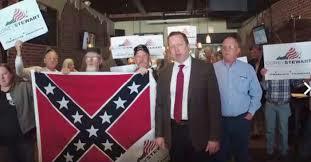 Because of Corey Stewart (who, like his idol Twitterman, trails disreputable baggage). Stewart made Charlottesville's push to remove its statue of Robert E. Lee the centerpiece of his campaign for governor, holding rallies for the monument and displaying Confederate flags while defending "heritage" at his events. At one point, he attended an Old South ball. He attended a news conference with the leader of the white supremacist protest that later resulted in the death of a counter-protester in Charlottesville. And after that counter-protester, Heather Heyer, was killed in a hit-and-run, Stewart blamed the violence on "both sides." With Twitterman, Stewart has become the norm in the Republican Party of 2018, and the now "old guard" of sane Republicans are withdrawing to the wings. The Koch network, which runs Americans for Prosperity, announced it would not support Stewart -- or anyone else -- and the US Senate Republican campaign arm is giving Stewart a pass too. Ouch. Incumbent Democratic Senator Tim Kaine had no primary opponent. 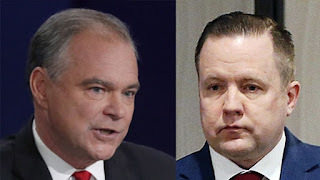 He'll run strong statewide, and meanwhile Corey Stewart is likely to depress turnout among suburban Republicans ... hurting the reelection prospects of at least three endangered Republican US House members. Now those are races to watch.